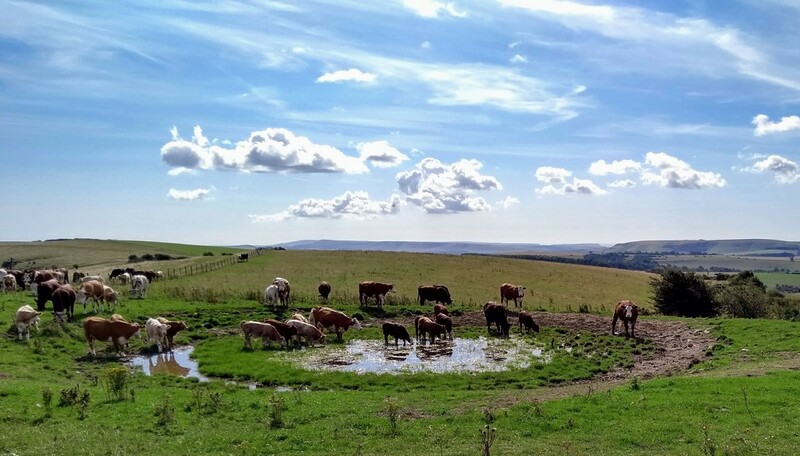 Cattle stopping for a drink at a dew pond on top of Ditchling beacon. Completely round, man-made water reservoirs, dew ponds have been features of the area for hundreds of years as a source of water for cattle and sheep. They stand out in the landscape as a geometric anomaly. It almost looks like a painting. Very nice composition. This is gorgeously composed. Love the lighting and the view. Awesome clouds too. I agree, it is lovely. lovely shot, looks like happy hour. A great shot - interesting info too. Beautiful scene. I love how cattle just safe in into the ponds to cool off. Thanks for getting this to TP and PP! Really wonderful shot! Just beautiful. Lovely capture, it looks like the cows are all lining up for a turn in the pool!